In 1882, while strolling down the beach in Messina, Sicily, where he maintained a private laboratory, the Russian zoologist Élie Metchnikoff found a live starfish that he poked with a rose thorn. The following morning, to his surprise, he found cells covering the thorn as though trying to engulf and destroy it. Metchnikoff recognized that this phenomenon of phagocytosis—an early and immediate line of defense utilized by most vertebrates, invertebrates, microbes, and plants to combat pathogenic organisms or foreign cells—had broader biological significance not limited to the starfish. This primitive invertebrate had remained unchanged for 600 million years, and it could provide insights into the evolution of the immune system, which defends the body against disease. Metchnikoff was the first to recognize innate or natural immunity, a discovery for which he was awarded the 1908 Nobel Prize. Innate immunity is a rapid nonspecific response that does not require prior exposure to the foreign organism or cell and utilizes a range of several modes of defense: The first line response to disease-causing microbes is the presence of anatomical or physical barriers, such as the skin or shell, mucus, and cells of the gastrointestinal and respiratory systems. Phagocytosis is carried out by neutrophils, white blood cells (leukocytes) in mammalian blood, and macrophages in tissues. An inflammatory response is activated by chemicals released at the site of injury that wall off and prevent the spread of infection. Then a complement system—in which more than thirty proteins (such as natural killer cells and interferon) are activated and mobilized—destroys and eliminates invaders. Both innate immunity and adaptive (or acquired) immunity—the latter only present in vertebrates and only activated after prior exposure to the microbe or cell—are based on the premise that the invaded animal can recognize which are its own cells (self) and which are foreign (nonself). In innate immunity, detection of nonself is signaled by the presence of pattern recognition molecules, which are present in foreign microbes but absent from animals. Identification of these molecules triggers the range of immune responses. Such was the response by Metchnikoff’s starfish. SEE ALSO: Lymphatic System (1652), Adaptive Immunity (1897), Ehrlich’s Side-Chain Theory (1897), Acquired Immunological Tolerance and Organ Transplantation (1953). 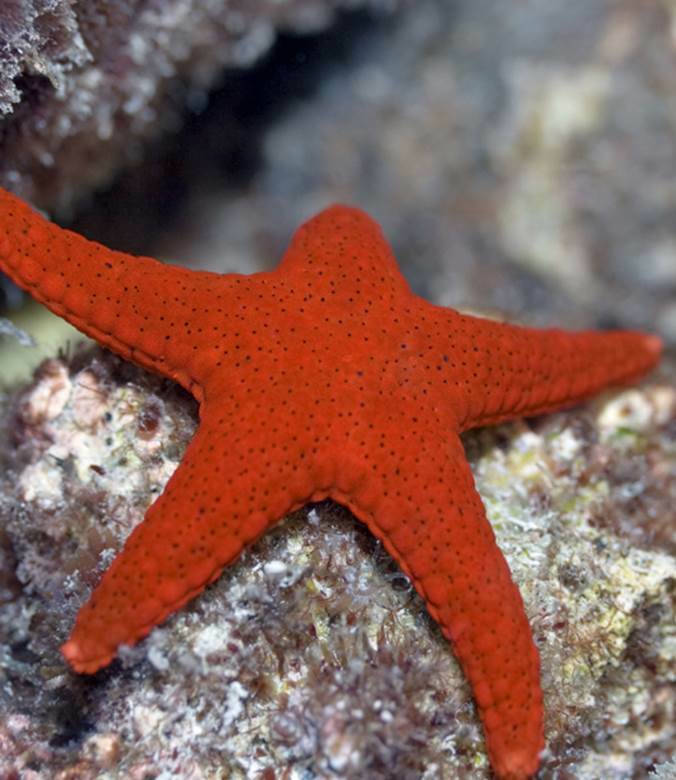 This red starfish (Fromia elegans), which has not evolved in over 600 million years, exhibits the phenomenon of phagocytosis, a primitive innate immune response, to remove pathogens.